This puzzle has a somewhat unusual shape for an Arrows puzzle. 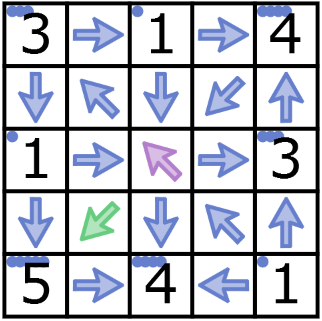 In particular, what stands out is that each arrow can point to only one or two numbers. If we sum up the numbers, we find that we need to hit them 22 times in total with 17 arrows, which means that exactly five arrows will have to point at exactly two numbers each, while the other arrows point at just one number. 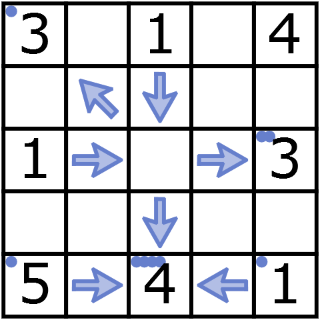 Since these five arrows have to be among the eight arrows in the outer ring, we could instead identify three arrows there that have to point at just one number. 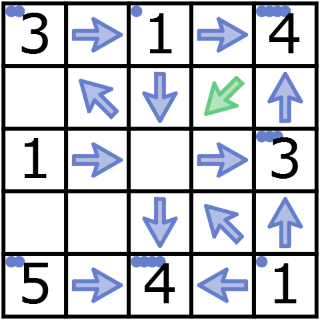 Both in the top row and in the leftmost column, the number 1 in the middle allows for at most one of the two arrows to point at two numbers, so at least one points at one number. 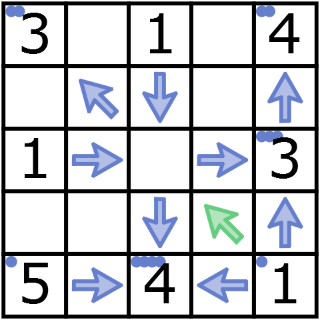 Furthermore, the number 1 in the lower-right corner implies that at least three of the four arrows in the bottom row and rightmost column are pointing in another direction, meaning at least one of them will have to point to exactly one number. So we have found 'at least one' arrow in the outer ring that points at exactly one number on three occasions, and we know there must be exactly three, which means we can replace each of those 'at least one' conditions with 'exactly one'. 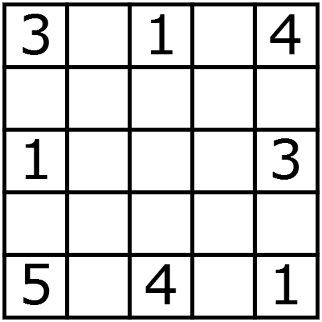 Even though we haven't yet identified precisely which five arrows point at two numbers, we do know now there is one in the top row (which covers the number 1 in the middle), one in the leftmost column (which covers the number 1 in he middle there) and three in the rightmost column and bottom row combined (one of which covers the number 1 in the bottom-right corner). Let's use this knowledge to fill in some arrows that have no other options remaining. We use dots to indicate the number of arrows that already point at a number. The two dots on the number 3 in the rightmost column now indicate there is only room left for one arrow pointing at two numbers in that column. Hence, both arrows in the bottom row have to be pointing at two numbers each, as shown below. Additionally, the green arrow (above) could not have pointed in any other direction than towards the top-left corner. The arrows in the top row have to point in the same direction (this is a consequence of one of them pointing at one number and the other pointing at two numbers), but this can't be to the left, since the number 3 only allows one more arrow to point at it. We can point those arrows to the right. After this, the green arrow (above) is only allowed to point toward the lower left. Finally, the purple arrow is the only one which can still point towards the top-left corner, after which only the green arrow can point towards the lower-left corner. This completes the puzzle. Thank you for that nice detailed solution Johan. I'd be glad to share some tips I've discovered while playing Arrow puzzles that have a grid containing numbered squares and a perimeter with empty squares where the arrows must be placed. 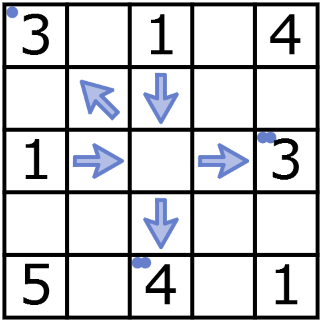 I play a lot of arrow puzzles online at the Otto Janko site.